Sierra Leone, UAE build Solar Park Freetown. Sierra Leone has taken a number of critical steps to commence the implementation of the Solar Park Freetown Project, its promoters have announced. These steps, according to the Sierra Leonean Government and the United Arab Emirates (UAE), include the ratification of the ADFD loan by the government, establishment of a working Project Implementation Unit (PIU) at the Ministry of Energy in Sierra Leone, and the recent re-appointment of the UAE based Advanced Science and Innovation Company (ASIC) LLC as the Project Manager and Lead of the Solar Park Freetown Project and the EPC, Mulk-OGI both as Consortium. The progress made in these areas was notified to ADFD and IRENA during meetings held on the sidelines of the 2016 World Future Energy Summit (WFES), where the Government of Sierra Leone, Ambassador to the UAE and the Ministry of Energy PIU met with ADFD and IRENA representatives and the Project Manager, ASIC. It was further discussed that, due to the falling world solar prices, the Project Consortium will try to include non-revenue generating assets such as an additional extension of road and grid-power infrastructure, incl. a necessary extension of the 161KV grid power line, distribution networks, and a substation as part of the total project cost, which will significantly and further benefit the Government and the people of Sierra Leone. The landmark 6MW Solar Park Freetown Project which won the first prestigious International Renewable Energy Agency and Abu Dhabi Fund for Development (IRENA/ADFD) financing facility, will provide clean renewable electricity to urban and western rural districts around the capital, Freetown. Officials describe it as a landmark renewable energy project in West Africa, adding valuable and needed clean electricity to the grid, as well as important power infrastructure and international know-how to Sierra Leone. Solar Park Freetown Project is specially designed to include a number of institutional and critical human resource arrangements for sustainable management and international best practices of the project facility, in order to provide a most efficient implementation of sustainable Renewable Energy and knowledge transfer, for Sierra Leone’s particular geographic and socio-economic situation. The ASIC General Manager also highlighted the important role that the Sierra Leone Diplomatic staff in the UAE, H.E. Ambassador Siray Alpha Timbo, Ambassador of Sierra Leone to the UAE, and Bahige Annan, Consul General of Sierra Leone in Dubai, as well as H.E. Ambassador Henry O. Macauley, Minister of Energy of Sierra Leone, and Dr Patrick Tarawalli, Technical Adviser / Head of the PIU, all played in making this project a reality. 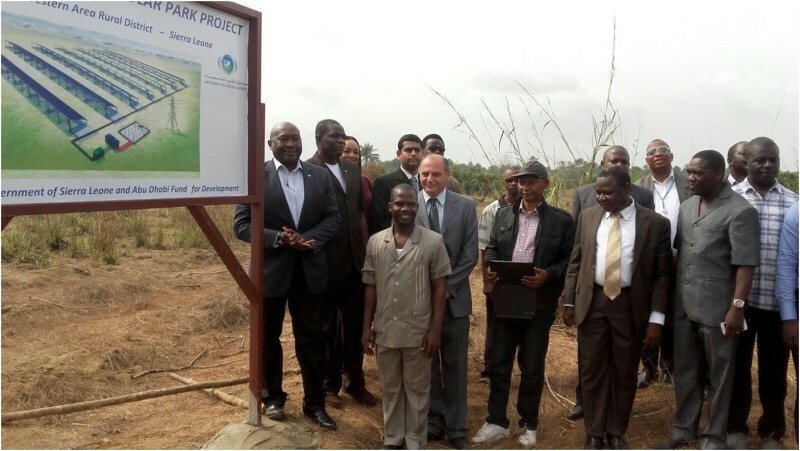 After the official kick-off meetings in Abu Dhabi with all the project stakeholders, the Solar Park Freetown Project Team at the Ministry of Energy, key stakeholders and consortium had an official Kick-off and ground breaking of the project in Freetown, Sierra Leone on March 9th, 2016. The ASIC-MULK-OGI team, in assistance of the PIU of the Ministry of Energy, assessed the site in Newton Freetown and prepared a step by step plan for the ‘on the ground’ project implementation. The team further made calculations and assessment on providing an extended Power supply and the construction of a 161KV Transmission Line and substation, all which will be included in the overall Project delivery cost and is a necessity for successful connection to the main grid. During the visit to Freetown, ASIC-MULK operational team together with the PIU outlined a road map of the the next high level steps in moving ahead with the project efficiently. Some of the immediate next steps of the road map were also discussed including the finalisation of the project master plan, the selection and sourcing of local contractors, on site mobilisation of EPC workforce, and the setting up of a project camp at Newton, which will host the workforce and provide capabilities of onsite liaison with the PIU, government and the local community.